Rosalind P. Marie is a certified school psychologist and educational planner. She lives in Harvest, Alabama. C. Claire Law is the founder of Educational Avenues®, a college educational consulting firm. She worked in college admission and financial aid at Carleton University in Ottawa, Ontario, the Art Institutes International in Atlanta, and Bryant University. She lives in Charleston, South Carolina. “This book is long overdue! At last two professionals have combined qualitative research, experience, interviews, and site visits to produce a practical guide for college bound students and their families. --Steven R. Antonoff, Ph.D., Certified Educational Planner, Antonoff Associates, Inc.
“No one other than Rosalind Marie and Claire Law could have written this book. They know students, and they know colleges. 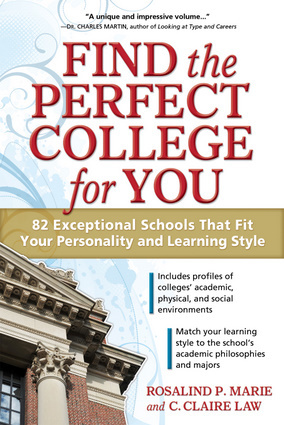 They tell you why and how a student’s MBTI® personality fits well at specific colleges. “Through the lenses of the MBTI® personality preferences, the authors reveal how students’ personality and learning style fit at specific colleges. The authors researched and merged student attributes with what the college offers. Students will find ready-made lists of colleges that are likely to be a solid match for them. “The process of choosing a college through this method is an entirely more self-directed, conscious way of going to college. Students will get to know themselves better and will understand the ethos of the college after reading this book.